Original article printed in Newsletter #20, Feb. 1993. Do you have that sagging feeling at the back of your Mustang? Does it have that middle age suspension droop? This is the problem of leaf spring cars and it seems to be especially true on BOSS 302 Mustangs. So, while your front coil springs are probably just fine, your rear end may be dragging. 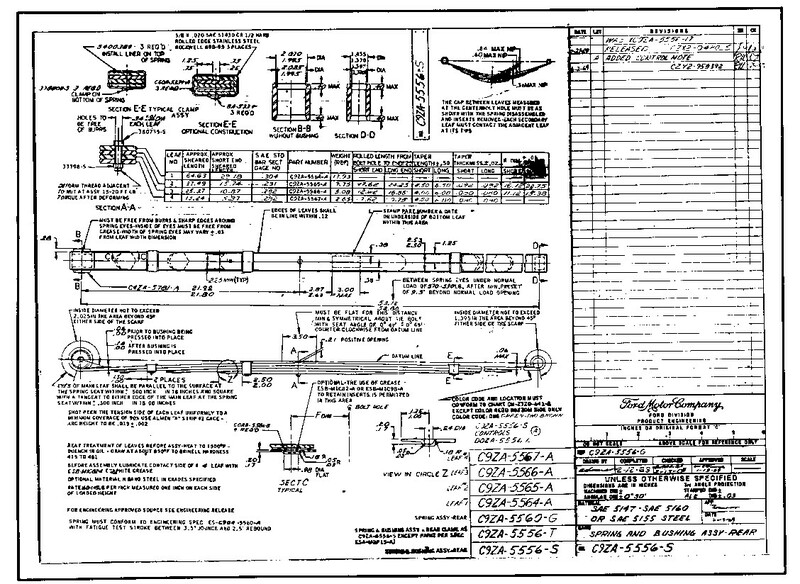 To diverge a little, the spring drawings (shown below, barely readable)* show that for a base service part number of 5560 there is a base engineering part number of 5556. This is a spring and bushing assembly. In the engineering part number scheme, a 5560 is a spring assembly without bushings. The individual leaves of the spring get numbers 5564-5567. Also note that there are two 5556 assemblies; one painted black and one bare metal. The painted assembly is for service while the bare metal assembly is Original Equipment for the assembly plants. The '69 and '70 BOSSes use the same spring except the '70 uses an updated D0ZA-5781-A* bushing while the '69 uses the old C4ZA-5781-A* bushing. Let's talk a little about the specs. on springs. The big parameters are load and rate. Rate is the measure of the springs stiffness given in lbs./in. The bigger the number, the stiffer the spring and the firmer the car will ride. The load is the measure of how much force it takes to flatten out the spring. This is the parameter that sets the ride height of the car. The suspension engineer will use these two items to control the car's ride and curb height in connection with the car's weight. These two, load and rate, are related directly through the arch (inch) of a spring. The BOSS 302 spring which has a spring rate of 152* lbs./in. and a load of 550 lbs. will have an arch of 550/152* = 3.62* in. That is why even when the cars were new they sat a little low in the back end. This was probably done to lower the center of gravity. I mention the spring arch because this is the parameter that the aftermarket spring makers use along with the rate. They don't use load. An aftermarket spring's ride height is spec'd. with the amount of arch it has with respect to its spring rate. Most of the Mustang vendors carry a spring that has over a 7 in. arch and a rate of under 140 lbs./in. This is their "one size fits all" spring. This is not what your BOSS wants. It will be way too high in the back end and have a slightly mushier ride too. What you need to get from your favorite spring shop is a # 42-441 spring. This is a standard spring number that all spring shops are familiar with. The spec's. on this spring are rate 153* lbs./in. arch - 5 1/2 in. This is just about perfect as it is the right rate and puts the ride height right back where it should be. I've installed a couple pairs of these and have been very happy. One word of caution. These are not concours correct springs. The clamps are not correct and the ends of each leaf are cut straight instead of tapered like the originals. Re-arching your original springs is what you need to do for a concours job. Re-arching is not recommended for cars that are going to be driven because it is a temporary fix. ** New information: Since this article was written, Eaton Detroit Spring, Inc. is supplying OEM rear leaf springs to the car restoration market. You can contact them and buy rear leaf springs with the original factory specifications for your BOSS 302. 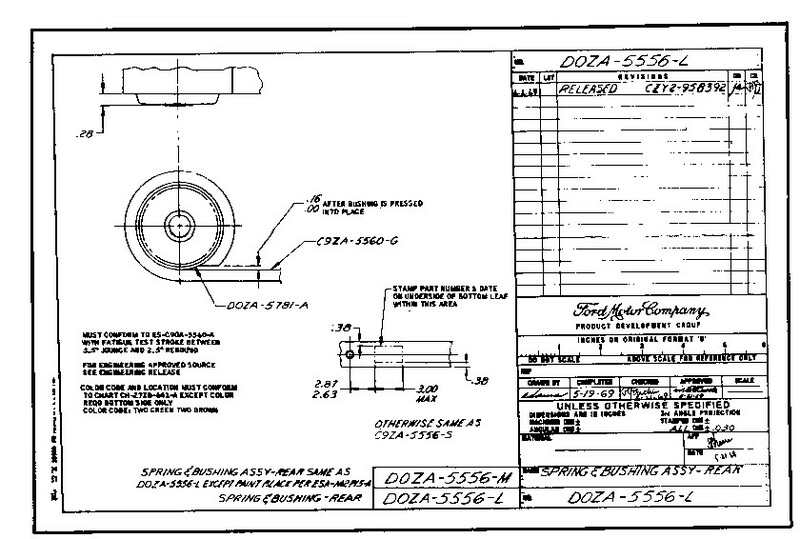 If you could read the prints or Ford Car Parts Book page below it would tell you the 1969 BOSS 302 Mustang rear leaf spring engineering part number is C9ZA-5556-S, the identification color code is 2 green and 2 brown stripes and the service part number is C9ZZ-5560-J. The 1970 BOSS 302 Mustang rear leaf spring engineering part number is D0ZA-5556-L, the identification color code is 2 green and 2 brown stripes and the service part number is D0ZZ-5560-C.
*** Ford used 12 different springs in '69 and 7 in '70. Spring load is the amount of weight required to bring the spring to a certain height, very rare is that height flat. Many times it is to a positive arch, however we see it to a negative arch also. When calculating Free Arch, Load/Rate, a "set" factor must be added. This "set" factor allows for the effects of shotpeening, settling and a few other things. Most times we use 1/4-inch for light springs and 1/2-inch for truck springs. BUT for Mustangs the correct "set" figure is 3/8-inch. So in the example shown above the correct Free Arch for the spring is 4-inches. The "one size will work for all" spring, 42-441 has a 135 lb. rate and will not work for all. * Modified from original printed in newsletter #20 February, 1993. ** Added to online version. Jan. 6, 2002. *** Added to online version. Jan. 30, 2003. Courtesy of Mike Eaton, Eaton Springs.